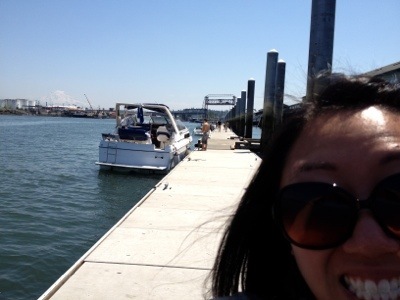 SUN and BOATS and even MT. RAINIER! WHERE THE HELL IS OUR SUMMER?! I HATE THIS PLACE, WE’RE MOVING. Or at least something along those lines. But as the Fourth of July came last Wednesday, our summer came with it. I am super happy about it. Can you see my happy face in the above photo?! The weather has been clear, sunny, warm, and breezy. This is what summer is all about! So I have almost forgotten about the horrible past 8 months we experienced. Almost. But since we are nearing an entire week of fun in the sun, I decided it was time to get all my ice cream makers and popsicle molds into the freezer to hog up space. 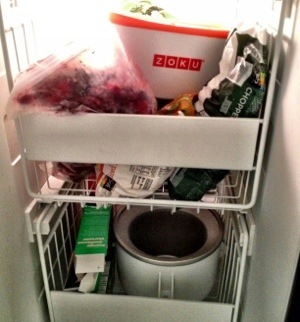 Who needs freezer space in the summer anyways, unless it’s for ice cubes, Thin Mints, ice cream, popsicles, and frozen produce (for smoothies)? 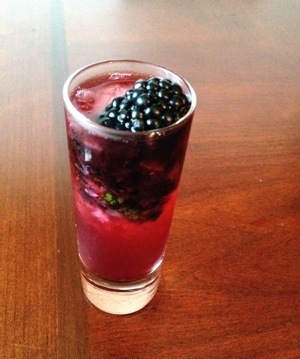 Blackberries are in season right now and since the Jensiuchi B&B has a guest coming at the end of July, I needed to test a new recipe for a blackberry gin bomb. And it was da bomb. OK, I lied. It wasn’t even decent. It had chunks of ice in it that stung my teeth, Bryan tried to take his like a shot and nearly choked to death, and the mint made them taste like blackberry toothpaste bombs. I think they will be better with a few tweaks though, so they will stay on my menu plan. But after making the blackberry gin bombs, I still had the entire container of blackberries leftover, so I thought it might be time to try out one of my saved ice cream recipes. 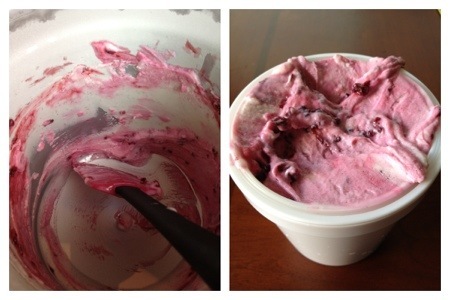 I opted for the “Easiest Frozen Yogurt with a Blackberry Swirl” recipe from CHOW. Unfortunately, as seems to be the theme of the Jensiuchi kitchen, I didn’t read the instructions correctly and had purchased milk instead of milk yogurt… Luckily I was able to find some decent yogurt last minute at our lame local grocery store. Sugar, berries, and a vanilla bean. YUM! Once I got through the first hiccup in my attempt at homemade FroYo, my blackberries bubbled up delightfully! It was super exciting too cause I got to use one of my real vanilla beans. That always makes me happy cause I bought a massive pack from Costco. We love Costco. Costco is like my best friend. The only thing I haven’t seen at Costco is quality Japanese chopsticks, which are in high demand with my family. I have watched my grandpa eat pizza with chopsticks and I am not sure my Grandma knows how to use a fork. They also love Costco. Are you listening Costco? Back to the story or more like back to another speed bump. I’m getting used to these by now and just embracing each messy event. A good kitchen sure as hell isn’t a clean one, right? No? Anyways, since I try to avoid plastic bag usage whenever possible we use paper bags when buying from the bulk section at the grocery store. I should bring in my own containers, but I always forget. So if you also use paper bags in the bulk section, make note: quinoa does not move well in a paper bag and it jumped out all over the counter mid-ice cream mixing. Some quinoa may have even landed IN the machine. Does this look like a monster from a scifi movie to anyone else? But despite a quinoa explosion, I was pretty happy with my first FroYo attempt. Bryan seemed to be pretty happy too, except for the fact that it was made with milk and made him slightly ill. I blame him for scraping the ice cream machine and eating too much of it. Seriously though, it looks like my next ice cream attempt will be dairy-free. Stay tuned for what I can only imagine will be another messy event. Make sure you have an ice cream machine! Wash your blackberries, then combine them with .25c sugar and the vanilla bean pod (ave the inside scrapings for the yogurt!) into a saucepan on your stove. Cook until the blackberry juices are bubbling and the sugar has dissolved. 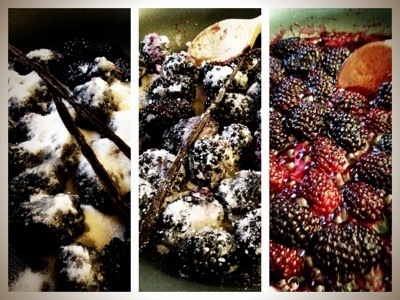 Remove from the stove and smash up about 50% of the blackberries. GENTLY! Don’t kill ’em! Now place into a bowl and refrigerate for about 2 hours or until chilled. 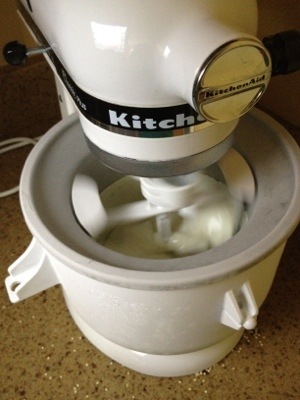 Whisk those save vanilla bean scrapings with .75c sugar and both yogurts. Cover and chill until berries are finished chilling. After your berry mixture is finished cooling, remove the vanilla bean pod and strain the berries through a fine-mesh strainer over a small bowl. You’ll want to save those delicious juices for ice cream topping or perhaps waffles tomorrow morning. Mmmm… Wafflesss… Set berries aside and begin making frozen yogurt in ice cream machine. 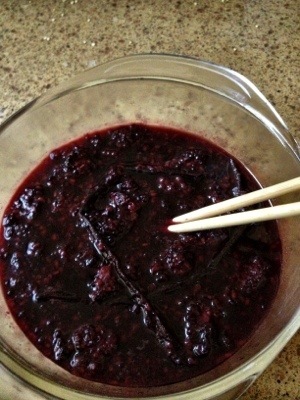 Once yogurt is the right texture, gently fold in the berry mixture. Serve immediately for soft-serve style yogurt or freeze for later use. If you plan on serving it later, allow the yogurt to sit at room temperature for about 15 minutes, otherwise you’ll never get it out!